(FinalCall.com) - A wave of revolts that engulfed countries in North Africa and the Middle East which deposed the long time presidents of Tunisia and Egypt has entered the Socialist People’s Libyan Arab Great Jamahiriya in the form of a civil war, threatening the leadership of Muammar Gadhafi who came to power amid a bloodless coup in 1969. However the historic response of the Western world to Libya was notably hostile, wrought with vitriolic personal attacks against Col. Gadhafi and outward calls for assassination, military intervention and a failed assassination. Political critics lambasted U.S. President Barack Obama for reacting too slow to the unfolding drama in Libya; albeit when he did react, it was different from the soft peddle diplomacy he used for Egypt’s Hosni Mubarak and King Hamad Bin Isa Al-Khalifa of Bahrain—where America maintains a military base guarding oil routes through the Suez Canal. In comparison the Obama administration’s dealings with Col. Gadhafi were particularly harsh. In a March 3 press conference, President Obama addressed the situation in the North African country by calling on Col. Gadhafi to step down and exit Libya. “Muammar Gadhafi has lost the legitimacy to lead and he must leave; those who perpetrate violence against the Libyan people will be held accountable,” President Obama said. To some observers, the president’s words were an eerie reminder of the language used by his predecessor, former President George W. Bush, in prelude to American aggression on Iraq. In March, 2003, Mr. Bush gave Saddam Hussein an ultimatum—vacate Iraq in two days or else. “Saddam Hussein and his sons must leave Iraq within 48 hours. Their refusal to do so will result in military conflict, commenced at a time of our choosing,” Mr. Bush warned after laying out a case for invasion and subsequent occupation. Some analysts disagree with President Obama’s message to the Libyan leader, saying it highlights a double standard within U.S. foreign policy. “Obama should focus on some other things, like the Israelis should leave the occupied territories; I think that would be a much better thing for President Obama to talk about,” said Bill Fletcher Jr., senior scholar for the Institute for Policy Studies in Washington, D.C.
“It would be much better for President Obama to talk about how the U.S. should not be spending money trying to destabilize the government of President Hugo Chavez in Venezuela,” he told The Final Call in a telephone interview. Furthermore, Mr. Fletcher sees the Libyan conflict as a “family problem” that the United States and other countries should stay clear of. Because of America’s involvement in Iraq and Afghanistan he is “skeptical” about armed intervention in Libya other than humanitarian assistance, evacuations or perhaps air support for the rebel forces. But questions loom if the Libyan opposition are united on accepting outside military involvement. “I am not convinced that the U.S. is in a position to do it, given Iraq and Afghanistan,” Mr. Fletcher opined, adding, “I think it’s important that the U.S. and the E.U. (European Union) stay out of the situation; this is an internal Libyan matter regardless of whether someone happens to side with Gadhafi or against him,” he said. Though defined for years as a rogue regime by American and British media and political figures, Mr. Gadhafi has a different reputation among liberation movements and in much of Africa. Pundits debating how the U.S. government should react to the events in Libya are torn between financing and arming the rebels, imposing a “no fly zone” or waiting because they admittedly don’t know exactly who the opposition is. This dilemma punctures the U.S. verbal posture supporting the will of the Libyan people when their real concern appears to be about vital national interests like oil. For now as deliberations continue, other avenues of pressure on Libya are being explored; Secretary of State Hillary Clinton is seeking to reopen the Lockerbie case— where an American passenger jet was bombed over Scotland in 1988, killing 270 people—with the intention of investigating and arresting more people and holding Muammar Gadhafi personally liable. Abdelbaset Ali el-Megrahi, a Libyan national was tried and convicted for the incident and later released in 2009 on compassionate grounds, suffering prostate cancer. At the United Nations, Libya was assessed a temporary suspension from the UN Human Rights Council based on alleged rights abuses against protesters. The Geneva-based council is charged with strengthening the promotion and protection of human rights around the globe. The action was coupled with U.S. and UN Security Council sanctions on Col. Gadhafi, his family and some members of government that includes an arms embargo, a travel ban and asset freeze. The UN also agreed to refer the case to the International Criminal Court at The Hague to investigate and prosecute possible crimes against humanity. 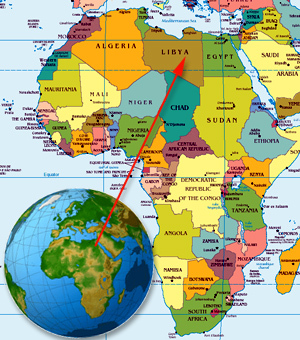 However countries like Russia and Venezuela cautioned that any propositions on the table such as the U.S./Britishled idea for a “no fly zone” over Libya should not be arbitrarily implemented. “A decision such as this one could only take place after a genuine investigation,” advised Venezuelan Ambassador Jorge Valero. Meanwhile an AP report said Libya has accepted a proposal from Venezuelan President Hugo Chavez to organize an International Mediation group of friendly nations to negotiate an end to the civil war. The idea won support in Caracas meeting of nations belonging to the Venezuela-led Bolivarian Alternative bloc (ALBA). AP said Cuba, Ecuador, Bolivia, Nicaragua, Dominica, St. Vincent and the Grenadines gave commitments of support for the group. There is general agreement that the regional uprisings stem from legitimate quests by the people for social and political reform, making their cause palpable for global support. It is also clear that the regimes that fell were longtime U.S. allies who perpetrated wrongs with at least the tacit, if not direct, approval and support from America—including millions in financial and military assistance. However, in Libya’s case, reporting filtered through corporate media from CNN, Al- Jazeera and Fox News manifested “support for the people of Libya,” while constantly leveling often unsubstantiated charges at its leader. “They are trying to do this whole low intensive propaganda warfare against the citizens of the United States, especially the negative assault against Gadhafi ,” said Dedon Kimathi, a political analyst with the All African Peoples’ Revolutionary Party- Guinea Conakry. “We have to be careful of the devil’s manipulation in media to have the world that watch and listen to U.S. media as their sole source of information to create a hysteric climate that we think Gadhafi is the next Hitler,” Mr. Kimathi said. Though defined for years as a rogue regime by American and British media and political figures, Mr. Gadhafi has a different reputation among liberation movements and in much of Africa. Millions see Libya’s leader as a powerful defender of the weak and oppressed. “We have to put it in historical context that Libya and the Jamahiriya revolution has been the most revolutionary African country since the CIA overthrow of Osagyefo Kwame Nkrumah (of Ghana), in terms of Pan-Africanism,” said Mr. Kimathi. Mr. Kimathi gave credit to Mr. Gadhafi for his political work around reviving the vision for a United States of Africa and transforming the former Organization of African Unity into the current African Union (AU). He also pointed out the “political and concrete material” support the Libyan leader gave to liberation movements and progressive organizations across the African continent and the world, including in the United States. Libya supported the Irish Republican Army, South Africa’s anti-apartheid movements—the African National Congress and Pan African Congress—the freedom fighters in Mozambique and the Palestinian liberation struggle to name a few causes. 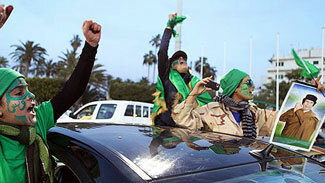 Libya has also been a friend to the Nation of Islam and other progressive groups within the U.S. In 1971 Mr. Gadhafi loaned the Nation of Islam under the leadership of the Honorable Elijah Muhammad $3 million to purchase a Greek Orthodox Church in Chicago. Mr. Muhammad converted the edifice into a mosque which is the national headquarters for the Nation of Islam. In the rebuilding efforts of the Honorable Minister Louis Farrakhan in the 1980s, Mr. Gadhafi gave a $5 million loan— which he then forgave—to aid an N.O.I. economic initiative called P.O.W.E.R. (People Organized and Working for Economic Rebirth). Mr. Kimathi pointed out that the Western destabilization campaign against Libya has been ongoing since the beginning of Mr. Gadhafi ’s leadership. As a visionary Mr. Gadhafi transformed the oil rich country into a popular people’s democracy, eradicating policies driven by the multinational corporations who exploited Libya’s resources. When he rose to eminence 41 years ago leading the Al-Fateh revolution against King Idriss—a minion of western imperialists—the young revolutionary nationalized the economy for the benefit and development of the Libyan people. Then he evicted the Americans and the British by shutting down the Wheelus military base in Tripoli which he condemned as a remnant of European colonialism. On the international political stage where good men often die young, Mr. Gadhafi has withstood the test of time, becoming a major power broker in Europe and in Africa. “Brother Gadhafi ” as he is known is in a small group of leaders—which include former Cuban leader Fidel Castro— who have the distinction of withstanding their imperialistic foes. Mr. Gadhafi was personanon-grata for every U.S. administration from President Richard Nixon to President Bill Clinton—until the warming of relations at the end of the George W. Bush administration. As of now the battle is between old internal enemies that escalated into a civil war to bring Mr. Gadhafi down. However The Wall Street Journal online noted U.S. Defense Secretary Robert Gates announced he had ordered to the Mediterranean the USS Ponce and the USS Kearsarge, an amphibious assault vessel designed to carry infantrymen and troop-transport helicopters. The report said the ships currently have 800 Marines, in addition to 400 U.S.-based Marines who will be airlifted to meet the ships. The ships would be ready to perform evacuations and humanitarian relief, he said. The fear is, however, that with war hawks and Libya haters in Congress and elsewhere demanding arming Libyans opposed to Col. Gadhafi that U.S. troops could end up on the ground. Not everyone is happy with that prospect. “I think (U.S.) military intervention would be terrible and we should oppose it,” said Mr. Fletcher.